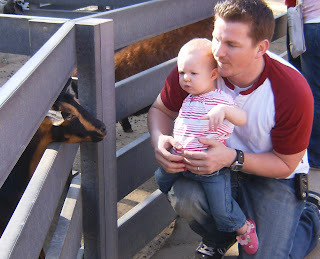 This was Emma's first time searching for eggs and she totally knew what to do.... we didn't even have to show her! At the park with Daddy! and she loves the park! We wnet to the beach with Jenna over spring break. It was emma's frst time at the beach where she could run around. She loved it. We haven't been back but will go soon. Playing in the sand with toys. 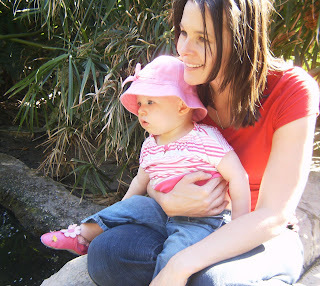 We went to the Santa Ana Zoo with Emma back in March. 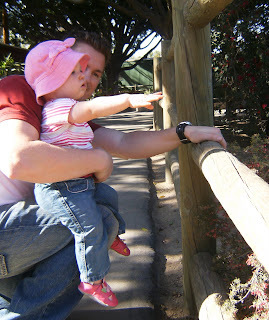 She loved seeing all of the animals... except for the parrot! For some reason the parrot's sqauwk scared her. 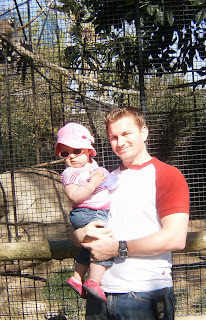 This zoo was the perfect size for her and it is a lot nicer than it used to be. These are the cows and there were horses and ponies as well. We are watching the turtles, the ducks and some birds.